All transactions are safe and secure with a reliable history in online purchasing behind each of our associates. Buy the Speed Racer Behind the Wheel to own Speed Racer clothing and merchandise. 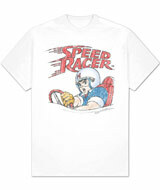 Blaze past the checkered flag wearing this distressed design that features Speed Racer behind the wheel of the Mach 5. Speed's intense face is masked by his helmet that bears his trademark 'M' just above the visor. Wear this tee under a Speed Racer hoodie sweatshirt. It is an adrenaline-filled tribute to the popular cartoon that features Speed and his family, including Pop's Racer, his younger brother Spritle, and the chimpanzee Chim-Chim. Other characters include Trixie and the Mach Five's mechanic, Sparky. In addition to the Speed Racer Behind the Wheel above, browse the Speed Racer Clothing Gallery for more apparel like men's and women's clothes, kids shirts or hoodies.